Remember when video magnifiers were simple easy to use machines that allowed the user to see things again? Well, over the last several years we have seen a Renaissance in the way companies are integrating feature after feature to make their offering the most complete system. The latest HD camera, check; the best HD monitor, check; Text to Speech (OCR), check; high contrast colors, check. But why stop there? As these "video magnifiers" become living machines, the next logical incorporation would be the ability to do your computing needs through the same device. Why shouldn't you be able to have one device, centrally located, where you can accomplish all your tasks and goals? The Revolution combines a video magnifier which can do table top viewing, distance viewing and self-viewing with it's integrated HD camera. There are a few devices in the market currently that can accomplish this, however, what this product also does is what sets it apart. The monitor is a 22" Android tablet computer which allows for a tremendous amount of additional functionality. There is a secondary, flip out camera on the side of the unit and an application loaded on the tablet which allows for a full page of scan and read (OCR). Once the application is started, the user aligns the paper underneath the camera and they will see it on the screen. Then simply click the left mouse button (if attached) or touch the screen and the program takes a picture and quickly begins to read the information back clearly and accurately,within 7-10 seconds. If you would like the words to be larger so you can follow along, you can either use the scroll wheel on the mouse or pinch to zoom directly on the screen. Pausing is accomplished by touching the screen or clicking the mouse button and you can move the page around the screen with your fingertip. Touch any word where you want to start reading again. In addition to this top of the industry functionality, the unit also serves as a tablet computer. The user can access the internet, use Skype, send and receive email (any email account can be used), create, edit and save Office documents, anddownload audio books. In addition, there are an endless amount of applications that can be downloaded from the Google Play and Amazon App stores from audio voice recorders, online banking, news apps, etc. There are also a number of cognitive stimulation games and activities that we see as beneficial for those individuals who are suffering from polytrauma situations. NorthState AT has tried, and succeeded, to make a total solution for the end user so they don't require several products scattered around the house. 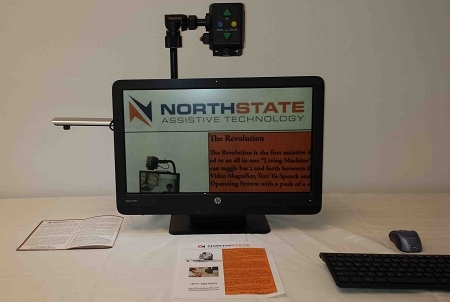 This unit can be centrally located and would serve as their video magnifier, document scanner/reader and touch screen computer. The reviews are very positive from all that have seen it and will save quite a bit of money when all things are considered. A comparison of a normal purchase might be a desktop CCTV (~$3,000), with OCR capability (+$895), Computer System ($1,250 - $1,500), ZoomText ($599), Office ($225 - $300) - Total $5,995 - $6294. The Revolution has a retail price starting at $2,995 for the base model (no OCR) and $3,695 for the Professional version which can do all of what is stated above. For more information you can check out The Revolution or contact me directly at 877-682-0452 or [email protected].